The Ontario ice lobe flowed southward from the Ontario lowland into the Appalachian Plateau of south-central New York and northeastern Pennsylvania--see Fig. 15-1. The plateau is a rugged region in which high elevations exceed 1200 m (4000 feet) in the Catskill Mountains. Hudson valley and Mohawk-Ontario lowland elevations are less than 150 m (500 feet). Ice-lobe glaciation of this high-relief plateau topography resulted in an unusual mix of landforms associated both with alpine and lowland style glaciation. Among the noteworthy features are the Finger Lakes, Valley Heads Moraine, till shadows, drumlins, and arcuate drainage system--see Fig. 15-2. MODIS image of New York, Pennsylvania and surroundings acquired from the Aqua satellite on Oct. 28, 2004. Autumn forest color is evident in this natural-color image of the region. Image adapted from Visible Earth. Glacial sediment is comprised of locally derived materials as well as far travelled exotics. The local bedrock of the Appalachian Plateau is primarily shale, siltstone, and sandstone of Upper Devonian age. These clastic rocks are dominantly gray or red in color. The Onondaga Limestone (Middle Devonian) forms a prominent escarpment along the northern margin of the Appalachian Plateau, and older sedimentary bedrock underlies the Mohawk-Ontario lowland north of the plateau. Still farther north, the Adirondack Mountains and Canadian Shield were sources for crystalline igneous and metamorphic rocks. Within the Appalachian Plateau, exotics include: limestone and dolostone, quartzose sandstone and quartzite, and all kinds of crystalline rocks--granite, syenite, gneiss, anorthosite, etc. Catskill Mountains near Hancock, New York. Rugged hilly landscape of the Catskills is part of the Appalachian Plateau of south-central New York and northern Pennsylvania. This region was completely covered by ice sheets during Pleistocene glaciations. Thick Upper Devonian shale, siltstone and sandstone strata exposed in the Genesee Gorge of western New York. Bedrock is nearly horizontal and undeformed. Photos © by J.S. Aber. Till is the predominant glacial sediment in upland areas; whereas, stratified glacial sediment is found mainly in the valleys. Till deposits form till shadows on the southern sides of upland bedrock ridges--see Fig. 15-3. The till shadows may be up to 100 m thick; if spread as a uniform blanket, till would average about 20 m thick over uplands of southern New York (Coates 1974). The sediment in till shadows is composed almost entirely of local materials--sandstone and shale; only 1-5% of pebbles are exotics. Upland exposure of till in Appalachian Plateau near Great Bend, New York. Till is composed of locally derived sandstone blocks and shale matrix. Exotics are very rare. Photo © J.S. Aber. Valleys of the region are marked by thick stratified sediment laid down in a variety of fluvial and lacustrine morphologic sequences--see Fig. 15-4. These sediments tend to have a high content of exotic material. These exotics are more resistant in the melt-water environment and were concentrated in stratified deposits--see Figs. 15-5 and 15-6. Kames, deltas, kettle holes, eskers and related landforms are all well preserved in multiple morphologic sequences of plateau valleys. Exotic crystalline cobbles from glacial gravel in western New York. Various igneous and metamorphic rock types. Gray cobble in upper right is anorthosite derived from the Adirondack Mts. of northern New York. Kame terrace formed on glaciolacustrine delta, Unadilla River valley, near New Berlin, New York. Note inclined foreset beds (dipping toward left) and topset beds near surface. This delta formed when the valley was flooded by a proglacial lake. Left: section across end of esker in the Chenango River valley near Brisben, New York. The esker is partly buried by outwash gravel, and the esker extends as a well-defined ridge in the background (to left). Right: close-up view of bouldery gravel core in esker at Brisben. Scale pole marked in feet. Photos © J.S. Aber. The Appalachian Plateau was glaciated many times, and deposits of previous glaciations were eroded and redeposited during later glaciations. Thus, exotic-rich stratified sediments in valleys were recycled and moved farther south within valleys during each episode of glaciation. Evidence of this reworking is seen in the fragments of glacial conglomerate found in valleys throughout central New York. These are pieces of carbonate-cemented glacial gravel reworked from deposits of previous glaciations. Cementation of gravel took place in the vadose zone (above water table) during ice-free periods after each glaciation. At least three generations of glacial conglomerates are preserved--postglacial, mid-Wisconsin and pre-Wisconsin (Aber 1979). This situation demonstrates an important principle--much glacial sediment is recycled from deposits of previous glaciations. Exposure of exotic-rich till within a valley of the Appalachian Plateau, central New York. Note rounding of pebbles and cobbles that were reworked from older melt-water gravel deposits in the valley. Scale pole marked in feet. Photos © J.S. Aber. Fragments of glacial conglomerate in till, central New York. The conglomerate formed by carbonate cementation of older (early Wisconsin) glacial gravel during a mid-Wisconsin interstade. The conglomerate was then eroded and redeposited in till during the late Wisconsin glaciation. Sample of mid-Wisconsin conglomerate fragment that contains a fragment of still older glacial conglomerate. The older conglomerate was presumably cemented during the Sangamon interglaciation within pre-Wisconsin age glacial gravel. Dime for scale. Photomicrographs of glacial conglomerate thin sections under cross-polarized light. Field of view is about 2x3 mm. Cement is bright-colored gray, yellow, and pink calcite crystals that surround sand grains (white, yellow and brown). Left: conglomerate formed by postglacial (Holocene) cementation of late Wisconsin glacial gravel. Right: conglomerate formed by mid-Wisconsin cementation of early Wisconsin glacial gravel. The Finger Lakes are often described as inland fjords because of their deeply eroded bedrock valleys and thick sediment infill--see Fig. 15-7. The Finger Lake troughs are generally wide and shallow toward the north (up ice) with thin sediment fill. Troughs become narrow, deep gorges to the south with thick sediment fill. Waterfalls and glens are common along sides of Finger Lake valleys toward the south. Deepest bedrock is located in southern Seneca Lake trough, more than 300 m below sea level, with maximum sediment thickness of 300+ m. The southern limit of strong glacial erosion is marked by the Valley Heads Moraine. This moraine consists mainly of ice-contact stratified sediment laid down over a major bedrock step in valleys, 13,000 to 14,000 years ago. Near-vertical space photograph of the Finger Lake district of central New York. A dozen lakes are found in two groups--eastern and western. These lakes occupy deep ice-carved valleys that have often been called "inland fjords." Click on the small image to see a larger (134 kb) version. Space-shuttle photo STS 51B-33-028, 4/85. Near-vertical space photograph of the central Finger Lake district, New York. The topography is highlighted by snow cover in this late winter scene. Click on the small image to see a larger (163 kb) version. Space-shuttle photo STS 45-71-61, 3/92. View northward from near the southern end of Seneca Lake. The lake is about 2 km wide at this point and extends ~50 km northward. Photo © J.S. Aber. Mullins and Hinchey (1989) developed a model for creation of the Finger Lakes and the drumlin field to the north--see Fig. 15-8. The model involves strong ice-stream flow enhanced by high-pressure subglacial melt-water drainage. Drumlins were molded by erosion in the open lowland north of the Appalachian Plateau. To the south, ice and melt-water flow became concentrated into valleys upon entering the plateau. This process was repeated during many glaciations, so the current landscape is a mature, end product of multiple glaciations (Coates 1974). Seneca Lake looking northward (left). Note steep bedrock cliffs along the east (right) side of the lake valley. The bedrock trough is about 2 km wide and more than 300 m deep (below lake level) here. View over the Seneca valley south of Watkins Glen, New York (right). The valley is underlain by more than 300 m of mainly glaciolacustrine sediment which partly fill the deep bedrock trough. Left: Hector Falls, on the eastern side of Seneca Lake valley, central New York. Such waterfalls are common features in the Finger Lakes region. Right: southern portion of Skaneatilles Lake, one of the eastern Finger Lakes. Note steep bedrock cliffs that descend into lake basin. 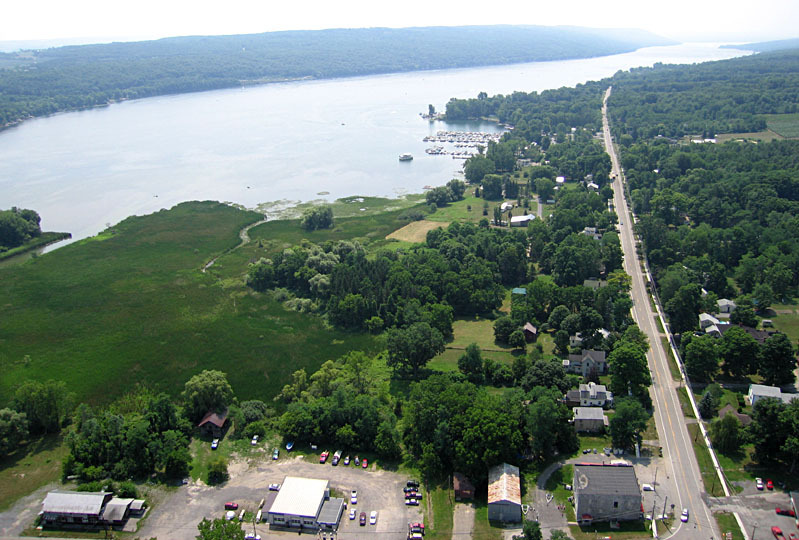 Topographic relief from uplands to lake floor is several 100 m.
Aerial view looking southward along West Branch Keuka Lake. The Village of Branchport is visible in lower right corner of scene. For more aerial views, go to Finger Lakes. Tully Lakes occupy kettle holes in the Valley Heads Moraine, southeast of Otisco Lake. The moraine is best developed in valleys (foreground), but is scarcely visible across adjacent uplands (background). Photos © J.S. Aber. Salt beds of the Salina Group (Upper Silurian) dip southward from the Ontario lowland beneath the Appalachian Plateau of southern New York--see Fig. 15-9. The salt strata are anomalously thin in the northern Finger Lakes region and become unusually thick south of the Finger Lakes. This pattern is a result of southward salt flowage induced by glacier loading over the Finger Lakes region. This salt deformation was brought about by glaciotectonism more than 1 km deep in the subsurface. Pennsylvania and the Ice Age. Large PDF file. ES 331/767 © J.S. Aber (2015).